Everything is good. 10 of Cups is one of the most happy cards. All the part of your life seem to be full and accomplished. Live in the moment as much as possible and bask in the happiness that is all around you. This entry was posted in Artist, Deck Review, Featured Card of the Day, General Tarot, Readings and tagged 10 of Cups, Artist, Card of the Day, Considerate Cat, Guidance, Madeleine Illustration, Path, Reading, Tarot. The happy couple sits on a budding branch of a cherry blossom tree watching their fledglings resting comfortably in their nest. The setting is one of peace and contentment. The couple achieved their dreams as each new day brings with a feeling of love and fulfillment. The 10 of Cups denotes a time of utmost joy. Another message of this card may also be a romantic relationship is forming, one that could result in a lifelong love affair. Take a moment to bask in the positive energy the 10 of Cups offers – good luck will soon enter your home. This entry was posted in Artist, Deck Review, Featured Card of the Day, General Tarot, Readings and tagged 10 of Cups, Artist, Crow Tarot, Guidance, M.J. Cullinane, Path, Reading, Tarot. What will make you happy? This is a much easier week now that all three eclipses are out of the way. Focus is once again turning toward hopes and dreams and all things which can be emotionally fulfilling. The 10 of Cups is our Happy! Happy! Joy! Joy! card, and it is amazing what a difference a few days can make. This is also another marriage card, as is the 4 of Wands which just came out two days ago, and I am mentioning this for there shall be one more before the week is done. It doesn’t need to be a marriage between two people, but since the theme is so prominent I felt the need to mention it. Our last trine with Jupiter and Neptune is drawing near this week, and the feelgood vibe seemse to be spilling over into the rest of the days. Humanity is showing its good side right now, if not in every corner of the world, at the very least it is taking prominence. Give careful thought this week to what it is that will truly make you happy, as this has probably changed over time. Jupiter is standing still in the sky today, and at some point in your day, is returning to direct motion. It is our planet of expansion, our giver of gifts and good luck, now poised to start dropping its blessings to many, giving some a double dose of good luck along the way. In two days, we will have a New Moon Partial Solar Eclipse in Cancer making many themes this week appear to be more emotionally-based. The 10 of Cups feels appropriate here as it sort of ties the two of these together to move you closer to the happiness you seek. The 10 of Cups is a card of emotional fulfillment, and, it is entirely possible (let’s not forget yesterday’s Star card), to see some incredible highs, even if they do not directly affect us, as well as some lows, for we are well into a roller coaster of an Eclipse season which promises to bring massive change. Family matters can come up around this card, and no coincidence here that the sign of Cancer is all about family. These are emotional times and people are very much a part of the equation. No matter which direction it seems to be going for you, be prepared to ride it out to the other side, somewhere toward the end of August. This entry was posted in Card of the Day, General Tarot, Love and Finance, Readings, YouTube Videos and tagged 10 of Cups, Card of the Day, Guidance, Path, Reading, Tarot. Upright meanings: Family values, happiness. Delighting in family life, bonding with family members. 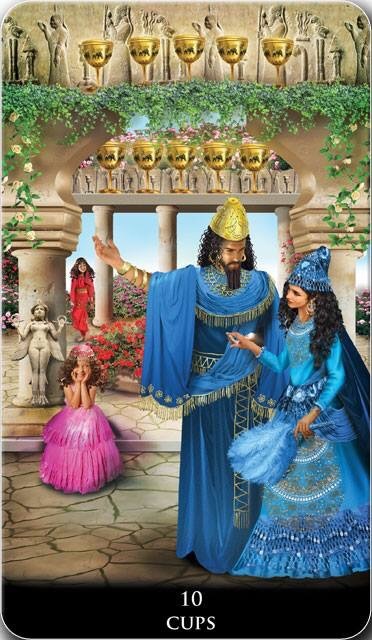 A nobleman and woman walk through a big chamber of the Babylonian palace. Their children are behind them near the pillar decorated with the Ishtar statue. The background of the picture is the wall with bas-reliefs and shelves on which ten cups stand symmetrically in two groups of five cups each, symbolizing a balance and well- being. The whole scene radiates good mood, peace, and cheerfulness, that is in the total harmony with the meanings of this card. This entry was posted in Artist, Deck Review, Featured Card of the Day, General Tarot, Readings and tagged 10 of Cups, New Babylonian, Roxana Paul, Tarot.